Imagine your typical morning coffee or tea, how it tastes and the way it makes you feel. Now imagine being on a remote island, sun rising, with your drink in hand. That sip is unlike anything you've ever tasted—that's context. When we feel something is out of context, it's because there's a mismatch in the intention, behavior, and environment. Looking at the Mona Lisa in a dark basement versus The Louvre surrounded by people taking photos creates two different memories. This month's global exploration of Context is chosen by our Minneapolis chapter and illustrated by David Schwen. Mar Deus Entorno el el acto de compra y consumo. Ana Lucia Cottone Orden Caos y Innovación” Ana Lucia Cottone Consultora Creativa en Knack Talent, Inc.
Joanna Gniady Don't be afraid to have fun with context. Airidas Janušauskas Is context important in communication? Rita Paskowitz What Else Do You Know About Me? The Audience Takes the Stage Audience members talk about their lives. Before we build anything on this earth we must heal ourselves from the root. Better design = better business = better design = better business. We're often working against nature, not with it. Nature was the original closed-looper. Minimizing harm is not being sustainable. We need a revolution. Surround yourself with people who are more experienced than you. Starting somewhere and doing is the best place to start. We envision a world that is more inclusive and community driven. We envision a world without waste. To make the world a better place I can do that through two things: Better business and better design. Trust the way that the dots connect. 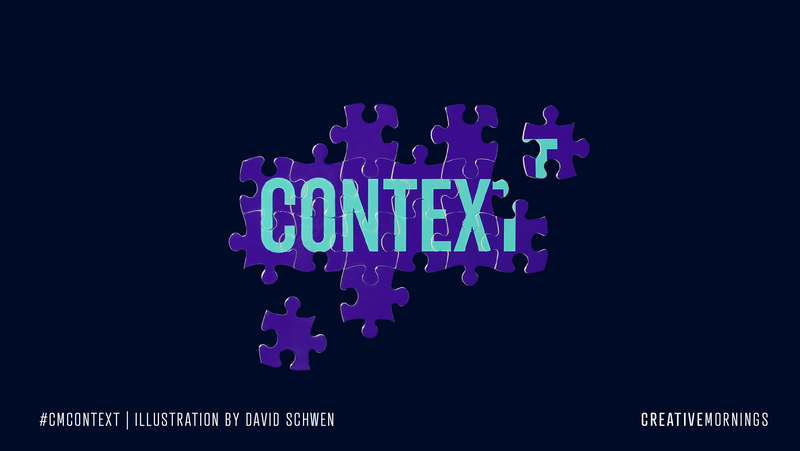 Context is shaped by what we choose to remember and the details that we decide are important. In every moment and interaction, you actually have the power to choose how you want to experience it. We must create our own narratives. Be aware of the information you are consuming and the media that is intentionally programming you. The time to grow from a place of love—and not ego—is now. Daily realize your trauma and your triggers. The moment to stop hiding behind them is now. That was the most liberating feeling that I’ve ever felt in my life … to be able to go into the different areas where the media said it’s only struggle—and I found beauty. Every moment is a process. Imagine as a creator what your life would be like if you never held back again. All of those things that society would tell me, out of context, are a hindrance and are a negative thing–are the very things that shape me and make me who I am, and the very things that I would never want to change about myself. If you move in a certain direction and never retrace your steps to try a different path - there's a whole lot that you may miss. If you can't understand your current perspective, your current framing, before you start digging into the unknown, you're basically positioning yourself down one road only. ...context is boundless - while it is boundless, the human mind has certain ways of framing things. As people we love to look at things as specimens...that's rarely the entirety of the story. The thread that has allowed me to work across different disciplines and industries has been my curiosity for understanding context. There's two parts to our role as creatives... and that's in understanding context...but then there's also the really critical part in creating context and that goes outside of what we classify as work in our "jobs". As creatives clarity and meaning are a huge part of what we do. Context turns competitors into comrades. Because each artist has their own story, we aren’t really competing at all. The beautiful thing about the digital world is that it allows us to connect instantly. Food is about connection and eating and community…eating well means gathering at the table with friends and family. What the world needs is a unique point of view – a specific way of looking at things. Artists with a unique context and voice. Is there a market for this? Or even better, can we create one? Be what you want to see because you never know who's watching and wants to be that with you. Never underestimate the power of social media. It allows us to get our context and perspectives out, our voice. Life doesn't get any easier—you get better. We had to be more than just party girls, more than just bloggers or mixologists. We had to be more. We realized how important our voice was in the community so dedicated to only share positive press, never posting images for clickbait or for payment. We wanted to create a setting to be able to tell our point of view and our story. There was no voice for the black female drinker in mainstream media or social media. You are important; your context: the way you were raised, the way your parents treat you, the way that your friends treat you, whatever your interests are. You need to remember that's what you bring to the table. You are not your title. Remember that bringing yourself to the table is enough. Sometimes showing up is enough. Because my influences took these weird paths to get to where they're at, maybe I can do the exact same. And it always started with a 'maybe'. "The news is 24/7. What's not 24/7 is how do I make sense of the news? Why is it happening? What's your point of view about why it's happening? Help me understand how I, as an individual, organize my mental framework for the news that is going on around me." We can’t subjectively quantify the value of an artist, but the context from which he- the artist is born, can. There are a lot of words in the English language that have two derivations. If we take meaning for example, we have: meaningless and meaningful. But when it comes context, there is only contextless. This is a point of view to consider. Brands are stories that we tell. Brands are promises that we make as business people. More important than making decisions is making meaning, is helping everybody make sense out of a complex world. I describe it in rules of thumb as changing the signal-to-noise ratio. We have too much noise—that's content. . . . What we lack is the ability to separate the signal from the noise—and that's what context is all about and ultimately that's what leadership is about. Fast Company, when we started it, didn't have a founding story, so I made one up. Because the nice thing about stories is they don't absolutely have to be true literally, they have to be true to the spirit of the story you're telling. Stories are how we connect with each other and how we make meaning in our lives. They provide context. They provide connections. They provide community. What's the story behind the data? That's context that explains what is important. Context seeks to explain what is going on in the world so that we can make sense of it. Context takes this commodity and transform it into meaning. Information today—content today—is a commodity. It's a very low value offer. What do we value? What creates value? Well, what creates value is context. Content is a commodity. Content is the digital equivalent of pig iron. 'Stuff' is all about content. You're going to be defined by something. It might as well be something that you love. Creativity thrives when devoid of the borders you build within your own mind. Stories are powerful, especially within the context that they are told or represented. My perspective as an ally is not the same as someone who is directly affected by the issue that I am exploring in my work. When I rise, they rise with me. As a child of immigrants, a product of two people who experienced extreme poverty and migrated to this country for a better opportunity, I carry their triumphs and struggles with me. If you look around, there is art all in this room. You're wearing it, you're sitting in it, Christmas trees, lights, sound, video, photographers, we've all got our phone out... those are all designed and created by artistic people. The arts are dying in school, and I agree, we've gotta find a ways to get it back in front of kids. It's the next generation of creative people. I'm an artist, but basketball just got in the way for 10 years. The journey and everything we do is the most important. The between is what matters most. It's not the beginning, and it's not the end. Take some every once in a while and just reflect on how you got to where you are.... and try to find a way to utilize all those experience in day-to-day. I'm proud of whats happened in my life. There was some pain at times, but I'm proud of what's happened because it's allowed me to be the person I am today. I took all that anger, all that drive, all that emotion, and I just threw it into my art. To not just only create, but to speak to people with confidence. I see my work as an artist as cultural currency that I used to invest back into the communities I connect with. When I come to this work, in all these different settings, it's not just finding the connections of our humanity, but it's understanding how I can utilize the creative process to amplify and elevate others' voices through the platform of public space in the most authentic way that I can. We are living in a time where we have an administration that supports white supremacy, hate, and racism. And as we tear down these monuments, both the physical and symbolic monuments, I'm dedicated to building new monuments than honor and elevate the people that are continuing to fight for freedom. As an artist working in communities, I believe it is important that we hold these experiences with care, and that we offer moments of healing through the creative process. I intentionally place my art in public space to say 'we are here, we have been here, and this is what we contribute to our society, and to our country'. I see myself and my family reflected in the many communities that I work with. I also understand that when I rise they rise with me. As a child of immigrants, a product of two people who had experienced extreme poverty and migrated to this country for a better opportunity, I carry their triumphs and struggles with me. "Your imagination, in my opinion, is what really gives us fuel - but sometimes there are things you just don't see until someone gives you the right words." Does anyone have a close personal memory of Aquanet? It’s Satan; it’s Satan on earth for women’s hair – as if cramps weren’t enough. December 8 Александр Трегуб: «Контекст. Веронезе, дизайн и комплекс самозванца». December 8 Alan Webber "Why Context Is More Important Than Content"